Jodie Wilson "Out on a Limb"
and never give in" are the words that inspired Jodie Wilson's new collection of work. Jodie has been weaving since early 2016 and launched herself and her work in July 2016 with an exhibition titled 'And She Flew'. Since then she has been busy making commissioned pieces for customers in NZ and overseas. Over the last year Jodie has had her work featured in Your Home & Garden Magazine, and The Australian Women's Weekly. Recently, contestants off The Block NZ commissioned a piece which has appeared on the television show. Jodie also runs weaving workshops where you can learn the tips and tricks and the basics of weaving. Shirley's technique involves the use of fibres, crystals, pens, foils, gold leaf, glitter, layers of resin creating depth and subtle iridescence with colour shift illuminated by light giving the work a unique vibrancy. Samantha Skovlund is 17 year old high school student who enjoys a number of extra-curricular activities that keep her busy. She in her exhibition: Fantasy, presents a number of her new pieces exploring the theme of 'Imagination' through different mediums and view points. "Keeping Abreast" aims to encourage artists to work in any medium to create artworks that responds to the theme of body image. Low body confidence, poor self-esteem or the trauma of breast cancer that can have a crippling effect on an individual’s emotional and mental state of mind. · How does social media affect one’s self-image and self-worth? · How does competitive marketing affect young peoples self image and expectations? · What does a health body look like and who even knows what BMI stands for? Join Forest and Bird Hibiscus Coast as we discover the regular residents of the Orewa Estuary and celebrate the return of the Bar Tailed Godwits after their flight from Alaska. Look for the Flock as you walk around the Estuary, and participate in our informative Walks and Talks series. Help us create the Estuary mural with onsite materials to colour your bird, plant or fish, and look for the beautiful prints of the birds, fish and plants created by local artists in a series of workshops run prior to the Exhibition. Bev Head, Debbie Martin, Lianne Timin, Val Cuthbert and Erinna Law, local printmakers and tutors are currently experimenting with the material of plaster as a vehicle to print onto. This allows her flexibility of shape and her "canvas" evolves and moves into the 3-D sculptural platform. Don't miss out on viewing this modern printing method. Val Cuthbert teaches printmaking at Estuary Arts Centre as well as through her own studio. Book now for Val's "Plastered" workshop on Saturday 23 September from 9.30am to 12.30 noon and learn more about this new and innovative technique. The association of New Zealand Embroiderers Guild Inc bring this regional award exhibition featuring embroidery and textile art from over 10 participating guilds. ​Coastal Views portrayed by Jill Bryce in both realism and abstract. Kerry has just returned to New Zealand after living in Seward Alaska since 1996 where she opened her Gallery/Studio. She enjoys working in different mediums, Dye on silk, Oil on Canvas, and Acrylics. "A movement of 82 yards of silk, designed and hung with the students from Seward High School"
“Exit Glacier” 16ft dye on silk, commissioned by the National Park Headquarters in Seward. Featured in “Arctic Inspirations” a book by Linda Chamberlin. Her commissioned works include: Murals, oil paintings and silks currently on display in New York, Los Angeles, Michigan, Utah, Hong Kong and Alaska more recently Had work in Hospice Show in Matakana. Road to Colour" A group exhibition of quilts celebrating colour in all its glory. Road to Colour was started by Cheryl Houston in her shop All Things Patchwork. The group, called Colour Quarterly, meet to inspire, learn and share their love of colour, fabric and making. Using fabric designed by Kaffe Fasset, Anna Maria Horner, Amy Butler, Cotton & Steel, just to name a few, the resulting quilts are a collection of contemporary modern day quilt making. Hilary Campbell and Jasper Boer "Coastal Cues"
Hilary and Jasper are bringing their creativity to the Hibiscus Coast and we are pleased to be displaying their work. The married couple has been combining their skills and talents and often collaborate. Hilary draws inspiration from Jasper’s photographs for her paintings and the pair also love to photograph weddings and take on design projects together. 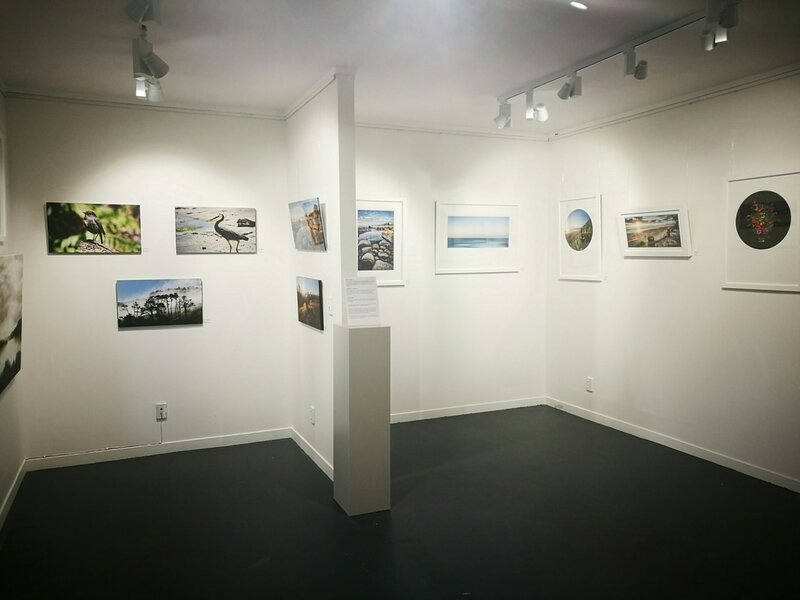 Jasper will be exhibiting framed and block-mounted photos of our native birdlife and local landscapes, often captured during sunset or sunrise. His latest seascape series are the result of using a contemporary technique known as Intentional Camera Movement (ICM), where the camera is in motion during the exposure for a creative and artistic effect, resulting in photos that give the impression of abstract paintings. 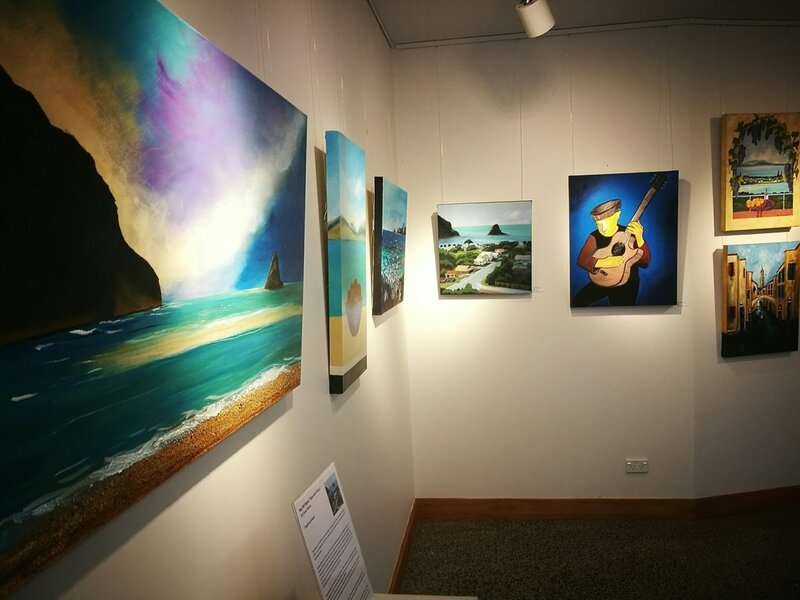 Hilary will be displaying a collection of oil paintings and illustrations, inspired by local bird life and landscapes which can be seen around the Hibiscus Coast. She uses rich colours and leans towards realism in her style an approach. Hilary Campbell, born and raised in Orewa, was a very keen artist throughout her childhood and teenage years at Orewa College. Going on to study graphic and digital design, she now runs her own business freehand.co.nz from home. She paints and does illustrations whenever possible and absolutely loves incorporating native New Zealand elements into her work. 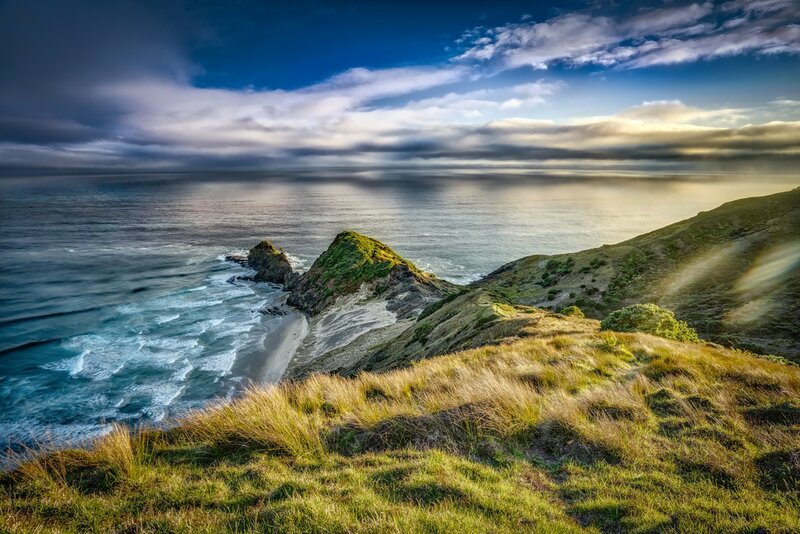 Jasper has moved over from Amsterdam, the Netherlands and through his strong passion for photography has successfully founded his business photoadventure.co.nz. After teaching landscape photography and post-processing to assist enthusiastic photographers to advance their skills, he is now sought after for weddings and family lifestyle shoots. Paintings created on a mixed media surface of leaves, lace and natural fibres. Jo graduated in 1981 from Training College majoring in Art. She embraced the creativity of being a kindergarten teacher and utilised the annual 12 weeks holidays to paint. Jo continued to study art through the Auckland Art society. Whitecliffe College as well as graduating from Hungry Creek Art & Craft School majoring in Panting and Ceramics. Jo has tutored art to both adults and children at Estuary Art Centre, College Community classes, Helensville Art centre and Lakehouse. Jo has won Art awards from the Pumphouse, the Easter Show, the Goldwater Award, [Waiheke,] and Franklin Art society. Jo continues to teach part-time and is concentrating on her arts practice. "I am dedicated to capturing the light in our natural world. Expressing in my art how important the trees are to our spirit and inner tranquillity"
Ray McTeigue "Bays and Vistas"
Ray grew up in Christchurch and was always drawing, constructing, or deconstructing as a child – once taking the roof off the chook house and converting it into the Alamo while his dad was at work. Having taken art at high school he joined the NZ Ministry of Works draughting division on leaving. However, hankering for new ideas and desiring more artistic mark-making than drawing technical plans Ray studied sociology at Canterbury University and took an arts prelim part time while draughting. Ray later qualified in landscape architecture and while practicing in this discipline frequently attended various short courses to study design, life drawing and painting to further his art interests. Hand drawing and rendering – pre CAD days – were essential to convey landscape design concepts and ideas to clients. Ray has focused more on his interest in painting in acrylics and oils since recovering from Lymphoma in 2010. Subjects have mainly been based on coastal and seascape motifs. Ray has been attracted to fluid sea colours and seemingly immovable coastal landforms that the sea flows and moves against. Acrylics are preferred for their fast drying, colour qualities and for glazing, though Ray enjoys oils for texture and the way this medium can be modified for longer and for wet-on-wet painting. Ray admits to experimenting with a range of styles at present often depending on mood and the weather, as many of his paintings are created outside in his studio garden from reference sketches of the coastal and seaside subjects, or from his own original schematic subject drawings. 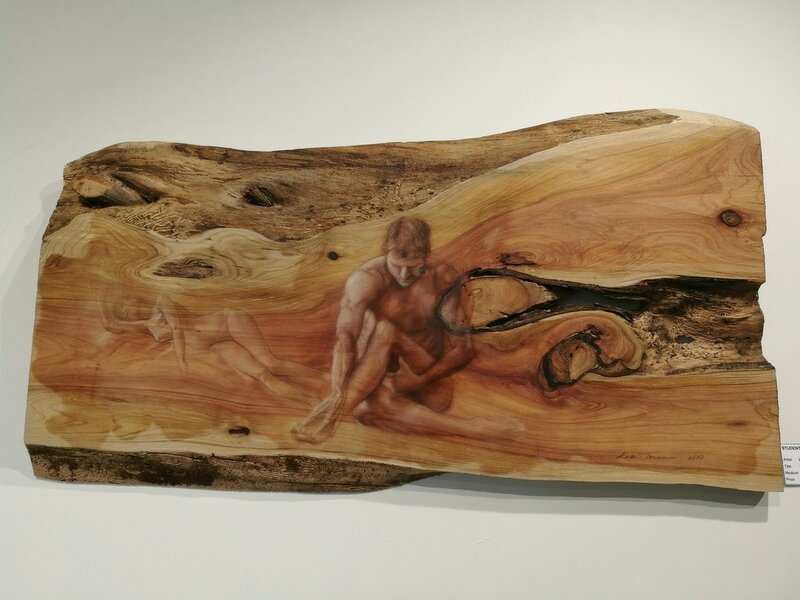 Kurt Weber "The art of wood"
Kurt is originally from Austria and has a mechanical Engineering degree spending much of his life servicing machinery in underground and open cast mining operations all over the world. Kurt and is family moved to New Zealand 21 years ago and in retirement he took up the hobby of woodturning. He lives with his family in Whangaparaoa and works with both native and exotic woods. View his exquisite range of vessels, forms and platters. "Foliage seems to be the poor cousin of the floral world. But I think leaves are beautiful in themselves and I want to set them centre-stage albeit in a dead and skeletal form. There are gold and earth colours to embed them in so the finished effect is part fossil leaves and part accidental /purposed paint. I have called the show LEITMOTIF: LEAF because this series of paintings uses a staccato repetition of one thing which is desiccated leaves in ,manner which is akin to the musical Leitmotif, a repeating signature phrase which builds the larger work "
A selection of past and present students who have taken a creative art course at EAC. Open to all students in any media. Super realist Robin's painting of local scenes are breathtaking in their detail and accuracy. 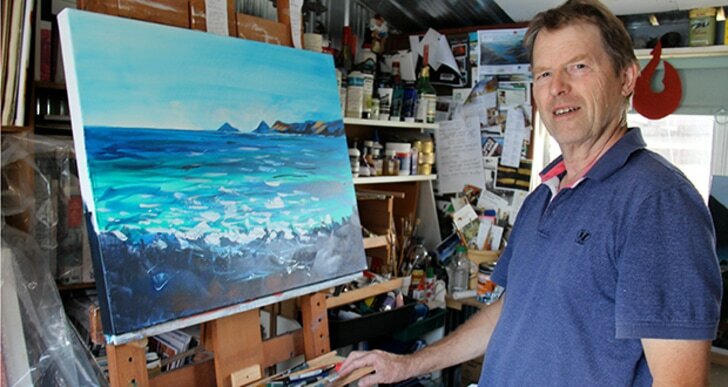 Meet Robin and watch him working live during the Hibiscus Art Studio Trail in March 11 to 12 between 10am and 4.30 daily. 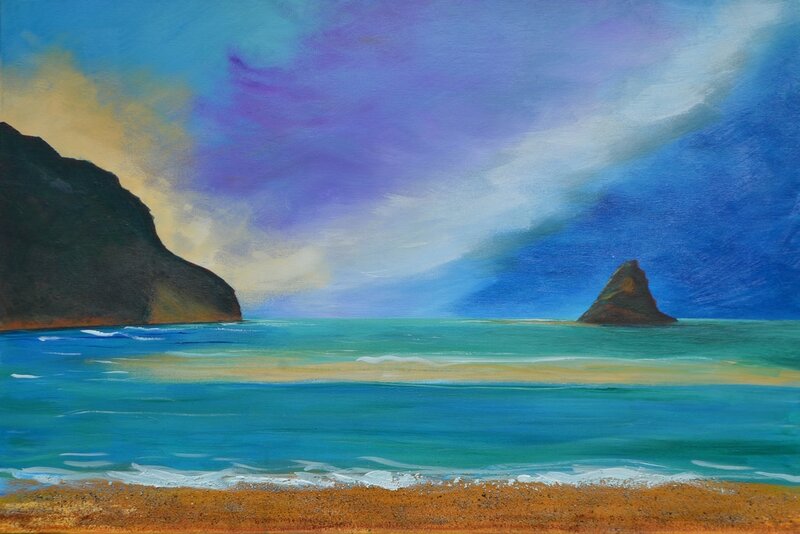 An exhibition of new paintings in oils and acrylics inspired by the environment out West from Bethels, Muriwai to Piha. "Photography has always been my passion; I am always on a quest to capture mother nature at her most pristine and sometimes volatile conditions. I feel privileged to share my creations and experiences with you."